This is Dragon’s first Panther G kit to include Zimmerit, an anti-magnetic paste that was originally applied to German armored vehicles. This coating is pre-injected, and carefully sculpted so that it is a true 1/72 scale reproduction of this German armor feature. This kit also includes numerous other new parts and special features that all contribute to make this a must build! The Panther was a tank of Nazi Germany in World War II that served from mid-1943 to end of the war in Europe in 1945. It was intended as a counter to the T-34, and to replace the Panzer IV and III, though it served along with them and the heavier Tigers until the end of the war. Until 1944 it was designated as the Panzerkampfwagen V Panther and had the Ordnance inventory designation of Sd.Kfz. 171. On 27 February 1944, Hitler ordered that the tank only be known as Panther. 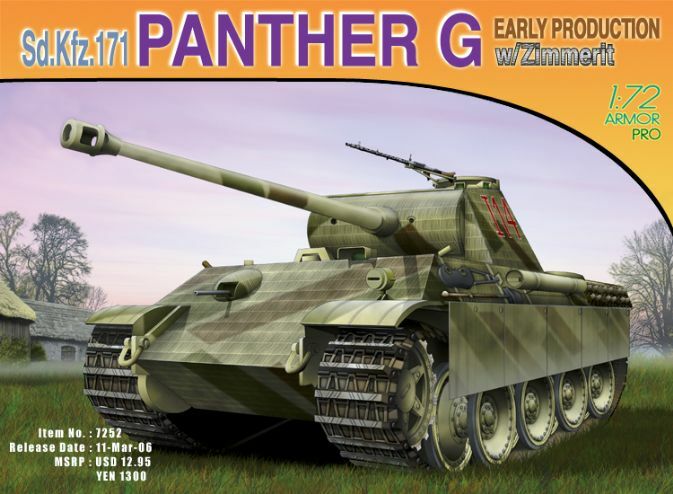 The Panther first saw mass action around the Kursk on 5 July 1943. Early tanks were plagued with mechanical problems: the track and suspension often broke and the engine was dangerously prone to over-heating and bursting into flames. Initially, more Panthers were disabled by their own failings than by enemy action. Panthers saw the most service on the Eastern Front, though by the D-Day landings of June 1944, Panzer units stationed in France were also receiving Panther tanks, which were used to good effect on that front. Approximately half of the German tanks in France were Panthers.